Typhoon in Hong Kong via Wikimedia Commons. Prayer: In the Midst of the Storm © 2014 Lisa Ann Moss Degrenia and Nicole Sallee. You are welcome to use this work in a worship or other devotional setting with proper attribution. Contact the Lisa for posting and publication considerations. If you worship in a space where the roof is designed to look like the underside of a boat, consider adding the following introduction before the prayer. You could also show a picture of such a worship space. Optional Introduction: Invite congregation to look at the ceiling or picture of ceiling. In many churches, the ceiling of the sanctuary is designed to resemble the underside of a boat or ship. In the Old Testament, that ship of safety and salvation would be Noah’s Ark. In the early days of Christianity, believers often had to hide when meeting together for worship, fellowship or study due to persecution. Some believe they may have taken refuge inside over-turned fishing boats on the shore line. 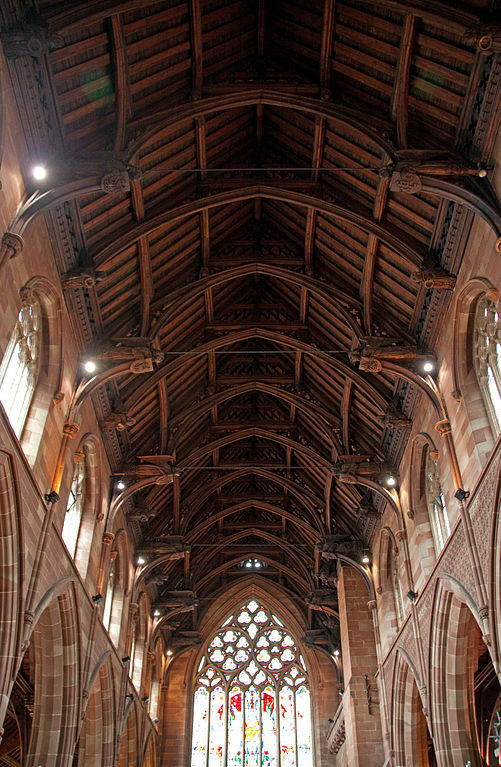 Later, as church buildings were built, the ceilings continued to resemble the bottom of a ship. Over time, this took on deeper meanings reminding us that God’s house is to be a place of safety and shelter, that Jesus is always near in the storms of life, and that Jesus is strong to save. Lord God Almighty, who is like You? Prayer: Boats and Storms © 2014 Lisa Ann Moss Degrenia. You are welcome to use this work in a worship or other devotional setting with proper attribution. Contact the Lisa for posting and publication considerations. A wise person once advised me, when you come across scriptures where Jesus is instructing or correcting the Scribes and the Pharisees, stop, listen, and allow the Holy Spirit to examine your own heart. We are often more like them than we want to admit. They were the “churched people” of their day. They too took their faith seriously, worshiped deeply, prayed and read the scriptures searching for God, answered a call and studied hard to prepare themselves for leading God’s people, bore the responsibility and sacrifice of leadership. Reflection and meditation on these texts keep us humble and soft in God’s hands. We need God’s grace and leading to avoid falling into the same enslaving practices. Create in me a clean heart, O God, and put a new and right spirit within me. Do not cast me away from your presence, and do not take your holy spirit from me. Restore to me the joy of your salvation, and sustain in me a willing spirit. 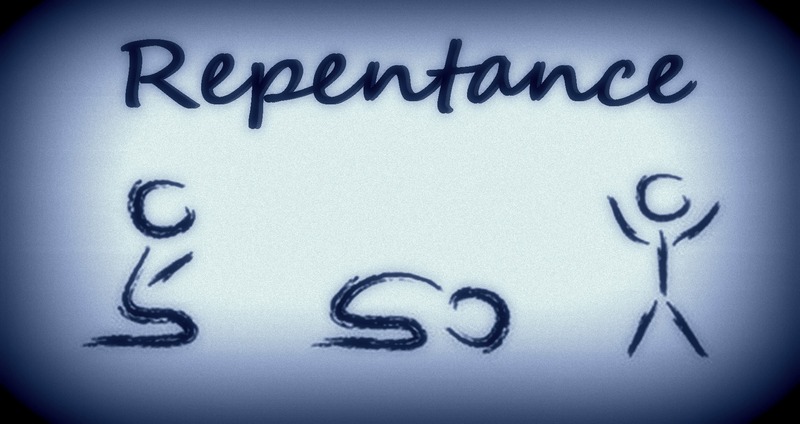 Then I will teach transgressors your ways, and sinners will return to you. God reveal in me where have I focused on rules and details above you. Free me from the need to control myself, others, and access to your love and grace. God reveal where my pride, ego and need for attention have become false idols. Forgive me and heal me of the judgmental attitudes which separate me from you and from others. God reveal every hidden thing I think and do which hurts others. Reveal my hypocrisy. Reveal where my attitudes and actions bringing contamination rather than community. Lord, have mercy upon me and raise me to new life in you. Verse 46: Woe also to you … for you load people with burdens hard to bear, and you yourselves do not lift a finger to ease them. God reveal how my actions and expectations are burdening others unnecessarily. Forgive me for placing myself above others and beyond accountability. Humble me and grow in me a love and solidarity with all people. God how am I perpetuating the prejudices and injustices of previous generations? Help me to join you in breaking this cycle. Verse 52: Woe to you… for you have taken away the key of knowledge; you did not enter yourselves, and you hindered those who were entering. God how am I making you and your ways confusing? Grant me a hunger for your truth and help my words to match my actions so others find you easily. 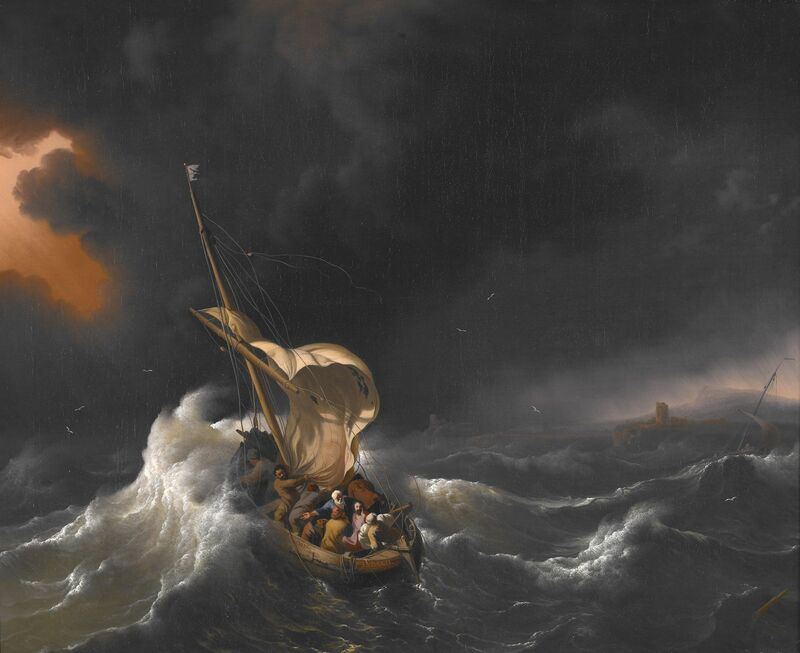 Christ in the Storm on the Sea of Galilee by Ludolf Backhuysen. Public Domain via Wikimedia Commons. Feel free to adapt the script to Matthew or Luke’s version of the story. Also, feel free to add sound effects for the storm, either recorded or a portion of the congregation live as another role in the storytelling. Jesus had been teaching and healing all day in Capernaum, near the Sea of Galilee. Leaving the crowd behind, the disciples took Jesus along, just as he was, in the boat. There were also other boats with him. and the waves broke over the boat, so that it was nearly swamped. Teacher, don’t you care if we drown? Who is this? Even the wind and the waves obey him! Looking for more on this scripture passage? Click here for a wonderful excerpt of the book Undone: A Story of Making Peace with an Unexpected Life by Michelle Cushatt. Reader’s Theater: Jesus Calms the Storm (Mark 4:35-41) © 2014 Lisa Ann Moss Degrenia. You are welcome to use this work in a worship or other devotional setting with proper attribution. Contact the Lisa for posting and publication considerations. 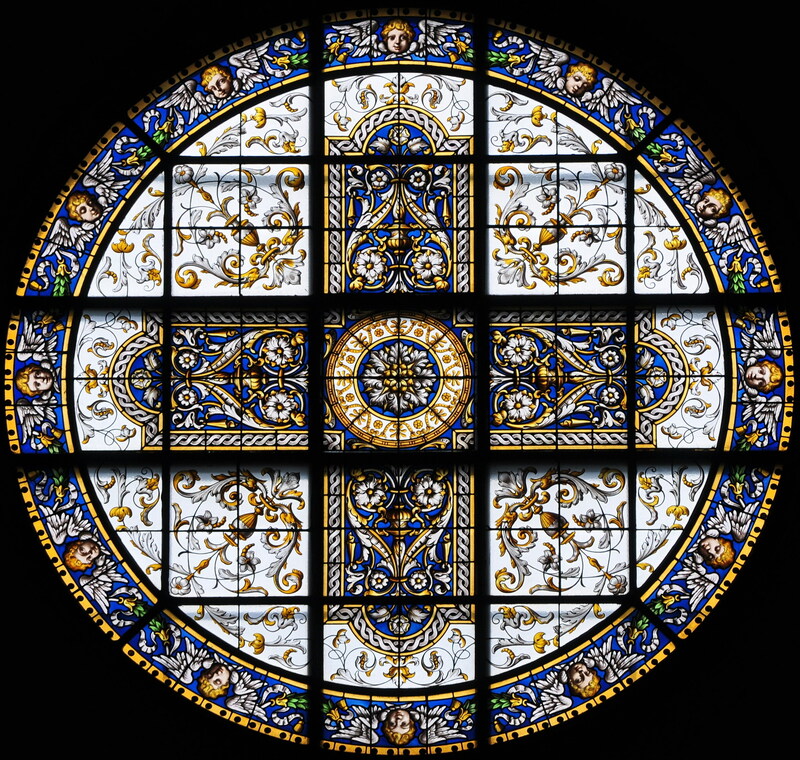 Window from Kirche Enge in Zurich Switzerland. Photo via Wikimedia Commons. Need more prayers? Click here for Steve Garnaas Holmes honest and hopeful Psalm for the Brokenhearted. 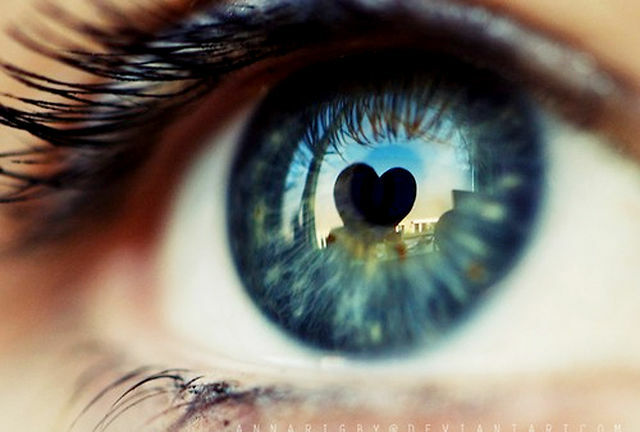 Your eye is a lamp, lighting up your whole body. If you live wide-eyed in wonder and belief, your body fills up with light. If you live squinty-eyed in greed and distrust, your body is a dank cellar. Keep your eyes open, your lamp burning, so you don’t get musty and murky. Instrumental music continues during the prayers. that working or resting, I may always think of you. that, at home or abroad, I may always walk in your way. that thinking or acting, I may always discern right from wrong. Rule my thoughts and feelings, my words and actions. that I may always look to the riches of heaven. that I may always seek your protection. that I may always find you in your wonderful creation. Rule my thoughts and feelings, my words and action. that amongst friends or enemies, I may always proclaim your justice. that, hungry or well-fed, I may always rely on your mercy. that I may always boast of you.